Part 2 for KaffeBox September 18 Box, in this post I’ll only write about the Colombian coffee Argote from the coffee roastery Vertical Coffee Roasters. In Friday’s post, you’ve been able to read about the coffee and also what I expect from the coffee. In this part, I’ll share my recipe for an awesome pour-over and Espro travel press as usual. At my cupping of Vertical Coffee Roasters – Kambiri AA Kenya, I have to say that the acidity that is described as berries is not to be found. It’s because it’s so hard to notice these flavors when you have a slightly darker roast than light. I think that this makes it even more acidic than it needs to. It has a syrupy body, I’ll admit to that. It reminds me more of a white slow balsamico which has been reduced a lot. That’s how I feel about the roast and that’s why the notes of berries get lost in the deep flavors of the roast. I would also like to know how good this coffee would be with “fika”. I tried it with a dark chocolate with sea salt. I understand that this can be a weird thing to try out, as almost all coffees are well matched with chocolate. But there are those who really don’t, and that may mean they are only preferred enjoyed on their own. For example: Do you like green tea with chocolate? I certainly do not. It’s a bit harder to combinate the coffee with cookies, but thanks to the roast it’s easier to drink than typical Kenyan coffee. 5) Remove all foam that’s formed on the top. Body is very slow and syrupy like, but I like the comparison to white balsamic vinegar with high acidity of fermented grape. Altitude: 1 700 meters above sea level. 1) 40g bloom for 40 seconds, stir with a bamboo stirrer to get all coffee moistened. 2) 225g water in a circular flow (this includes 40g water blooming). This including 40 second blooming, your timing should be in 2 minute and 15 seconds. However, the coffee was not as expected, a typical Kenyan coffee should be really light red and hold a brewed cup reminiscent of a red sandy beach. Almost like tea actually. The coffee is like I wrote above the acidity is so close to a balsamic vinegar rather than just the tones of berries. In the previous post, I talked about their design, the bag and purely about them. Vertical Coffee Roasters has a nice detail I have to say. 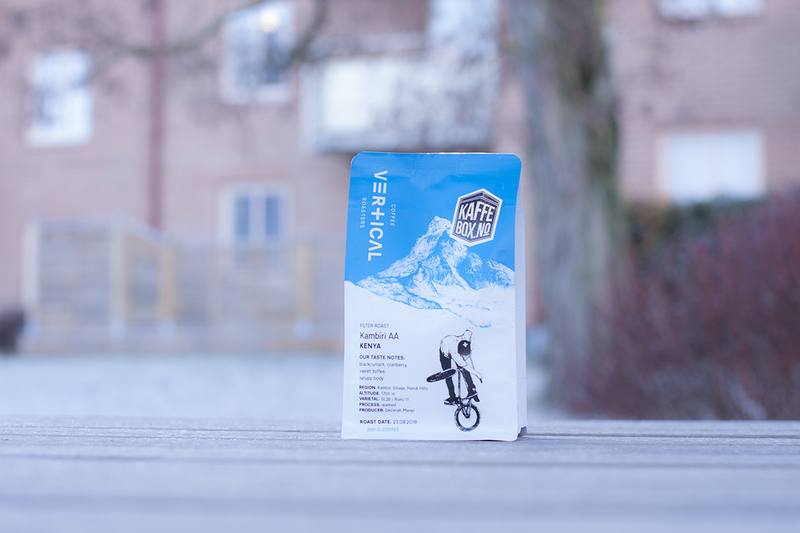 On their packaging they always have a white cross, in this case, on the bicycle helmet and on the first coffee it was on the bottom of the snowboard. White cross is the same symbol on the Swiss flag. If you have an Espro and a Pour-Over… What should you choose to brew with? Do you want a more balanced cup, go with the Espro, you also get a great result every time as it’s impossible to make mistakes. Vertical Coffee Roasters had me impressed on the first coffee, but I have to say that after drinking the first coffee this left me disappointed. However, they surely put the name Vertical Coffee Roasters on my radar. If you want to buy your very own KaffeBox and go through my recipes and reflections, be sure to order it so you can be ready for next month’s KaffeBox. Click here to order from their website. Use “kaffenytt” as voucher code, you’ll get 20% off your first purchase and I won’t get anything, this is only something I requested so I can give something to you readers! Do you want to read all of the reviews on KaffeBox monthly boxes? Click here!